What a great holiday season! Like many I’m enjoying some time off work, spending time with friends and family and, of course, indulging in delicious food & drink. Every holiday season comes with the joy of giving and receiving lovely gifts and I’ve been lucky as always with lots of great stuff. What did I spy under the tree this year but a big, round, oddly-wrapped package which revealed itself to be a gigantic boiling water canner. That’s right, I now have my very own canning equipment, or at least a vital component thereof. Now I have been using my grandma’s canning equipment and I don’t want to dis my grandma’s boiling water canner. Once we swept out the cobwebs it worked perfectly. Sure it had some sedimentary residue, some rust and was a bit tippy, but it worked great, really. 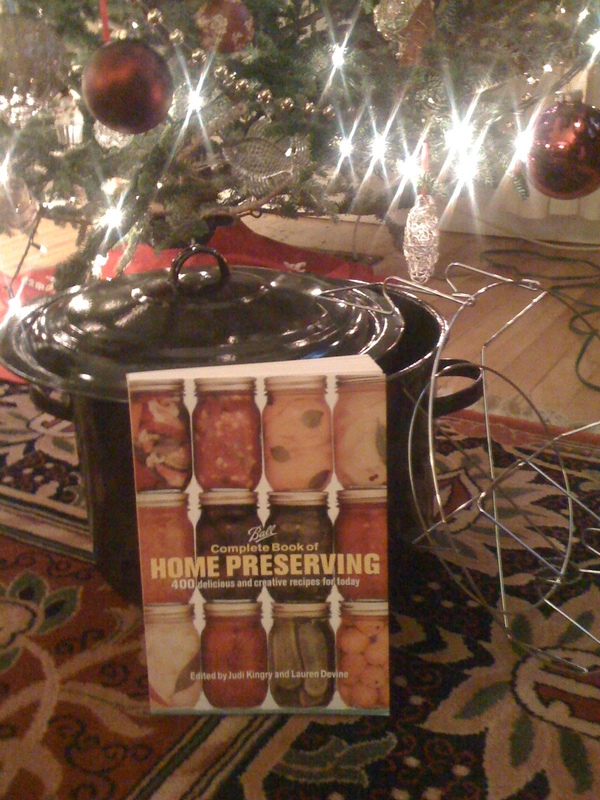 This excellent and thoughtful gift from my parents paired with the comprehensive Ball handbook of canning and preserving will surely signal the beginning of a whole new era in my canning career.